The following is a list of all light rail systems in North America, ranked by ridership. Daily figures for American and Canadian light rail systems are "average weekday unlinked passenger trips" (where transfers between lines are counted as two separate passenger "boardings" or "trips"), unless otherwise indicated. For light rail systems in the United States and Canada, these figures come from the American Public Transit Association (APTA) Ridership Reports statistics. For Mexico, the figures are obtained from Banco de Información Económica's Instituto Nacional de Estadísitica y Geografía (INEGI), and the daily figures represent daily passenger trips averaged from the monthly and quarterly ridership figures. All figures are from 2016 and the fourth quarter (Q4) of 2016, unless otherwise noted. "Daily boardings per mile" figures have been rounded to the nearest 5 or 10. The question of which systems would count as "light rail transit systems" is debatable, so this table includes some systems (such as Toronto's) which are technically streetcars rather than "true" light rail. American Public Transportation Association - Transit Ridership Report - Q4 2016. ^ a b c This is the Average Daily Ridership figure, not an "Average Weekday Ridership" figure – it is averaged from the Q4 2014 Total Ridership figure for this system. ^ a b c d e f g This system also has a heavy rail rapid transit/metro portion (see List of metro systems); the ridership figures and statistics here represent the light rail portion of the system only. ^ a b c d e f g h i j k l This line or system is operated using heritage streetcars. ^ It is debatable whether this system truly qualifies as "light rail" (or as a true "transit" system either), but it is included in the table anyway for comparison purposes (and due to its ridership statistics being tracked by APTA). ^ This system is owned by the City of Portland, which is not a member of APTA, and its ridership figures are not included in the APTA statistics for Portland. ^ This annual ridership figure is for Fiscal Year 2014, which covers the period from July 1, 2013 to June 30, 2014. ^ This figure is from Portland Streetcar's First Quarter Fiscal Year 2015 (Q1 FY2015), which covers the same calendar period as Q3 2014: July to September 2014. ^ a b c The MATA Trolley system completely suspended operations for a significant portion of 2014 (including all of Q4 2014) due to maintenance issues. ^ a b c "Transit Ridership Report Fourth Quarter and End-of-Year 2017" (PDF). American Public Transportation Association (APTA). March 13, 2018. Archived from the original (pdf) on 2018-03-27. Retrieved 2018-04-17 – via http://www.apta.com/resources/statistics/Pages/ridershipreport.aspx. ^ a b c "Banco de Información Económica - Instituto Nactional De Estadística Y Geografía - Comunicaciones y transportes". Instituto Nactional De Estadística Y Geografía (INEGI). March 2015. Retrieved 2014-04-02. ^ a b c "Características del Tren Eléctrico" [Characteristics of the Electric Train] (in Spanish). SITEUR. Archived from the original on 2016-08-16. Retrieved 2017-05-19. ^ a b "Estaciones Tren Eléctrico" [Stations Electric Train] (in Spanish). SITEUR. 2013. Archived from the original on 2013-07-28. Retrieved 2013-08-06. ^ a b c "2012 - TTC Operating Statistics". Toronto Transit Commission. 2013. Retrieved 2013-07-26. ^ "Toronto's Streetcar Network - Past to Present - History". Toronto Transit Commission. 2013. Retrieved 2013-07-26. ^ a b "About Calgary Transit / Corporate Information / History". Calgary Transit. City of Calgary. 2015. Retrieved 2015-07-17. ^ "About Calgary Transit / Corporate Information / History". Calgary Transit. City of Calgary. 2015. Retrieved 2015-09-09. ^ a b c "About the T - Financials - Appendix: Statistical Profile" (pdf). Massachusetts Bay Transportation Authority. 2007. Retrieved 2013-07-13. ^ "MTBA - About the MTBA - History - The Rapid Transit Commission and the BERY". Massachusetts Bay Transportation Authority. 2013. Retrieved 2013-08-07. ^ a b c d e "Metro – Facts at a Glance". Los Angeles County Metropolitan Transportation Authority (Metro). November 18, 2016. Retrieved 2017-05-19. ^ a b "F Market & Wharves | SFMTA". San Francisco Municipal Transportation Agency. 2013. Retrieved 2013-08-25. ^ a b c "Rider Information – Market Street Railway". Market Street Railway. Retrieved 2013-08-18. ^ a b c d "Muni Metro Light Rail | SFMTA". San Francisco Municipal Transportation Agency. 2013. Retrieved 2013-06-30. ^ a b c d e "The Way We Move LRT for Everyone" (pdf). Edmonton Transit System and City of Edmonton. pp. 4–5. Archived (PDF) from the original on 2015-09-10. Retrieved 2017-05-19. ^ a b "Vintage Trolley". San Diego Metropolitan Transit System. Retrieved 2015-12-30. ^ a b c d e "San Diego Trolley Fact Sheet" (pdf). San Diego Metropolitan Transit System. February 2013. Retrieved 2015-12-30 – via http://www.sdmts.com/about-mts. ^ a b "Facts about Dallas Area Rapid Transit (DART)". Dallas Area Rapid Transit. April 22, 2015. Retrieved 2015-09-09. ^ a b "DART History". Dallas Area Rapid Transit. 2015. Retrieved 2015-09-09. ^ "DART.org - DART Schedules". Dallas Area Rapid Transit. 2015. Retrieved 2015-09-09. ^ a b "Servicios. - Servicio de Transportes Eléctricos del D.F." [Electrical transport service of the Federal District] (in Spanish). Servicio de Transportes Eléctricos del Distrito Federal. Archived from the original on 2012-07-16. Retrieved 2013-07-07. ^ a b c "RTD - Facts & Figures". Regional Transportation District. May 24, 2013. Retrieved 2013-07-23. ^ a b "RTD - Facts & Figures - Central Corridor Light Rail Line". Regional Transportation District. January 2013. Retrieved 2013-07-23. ^ "SEPTA - Trolley Lines". Southeastern Pennsylvania Transportation Authority. Retrieved 2013-06-28. ^ a b c "SEPTA Route Statistics 2016" (pdf). Southeastern Pennsylvania Transportation Authority. 2016. Retrieved 2017-05-19. ^ a b "SEPTA - Media Guide" (pdf). Southeastern Pennsylvania Transportation Authority. 2013. Retrieved 2017-05-19. ^ Hepp, John. "Streetcars". Encyclopedia of Greater Philadelphia. Rutgers University Camden. Retrieved 2 December 2018. ^ a b c d "Schedules – SoundTransit". Sound Transit. 2016. Retrieved 2016-03-29. ^ Beekman, Daniel (March 19, 2016). "Capitol Hill, UW light-rail stations open to big crowds". The Seattle Times. Retrieved March 29, 2016. ^ a b c d "METRO Blue Line - Facts About Trains and Construction". Metro Transit. 2013. Archived from the original on 2014-02-14. Retrieved 2014-06-15. ^ a b c d "Metro Green Line Fact Sheet". Metropolitan Council. June 14, 2014. Retrieved 2014-06-15. ^ "Front Lines 2015 Map" (PDF). Utah Transit Authority. Archived from the original (pdf) on 2013-11-25. Retrieved 2013-07-02. ^ "UTA History - Fact Sheet History 2012" (pdf). Utah Transit Authority. April 2013. Retrieved 2013-08-11. ^ a b "TRAX and FrontRunner Map". Utah Transit Authority. Archived from the original (pdf) on 2013-06-20. Retrieved 2013-08-25. ^ a b c d "METRO About Us". Metropolitan Transit Authority of Harris County, Houston, Texas. Retrieved 2013-07-23. ^ "MetroRail Rider Guide" (pdf). METRO. May 23, 2015. Retrieved 2015-09-09. ^ a b c d e f "NJ Transit Facts At A Glance - Fiscal Year 2014 - July 1, 2013 through June 30, 2014" (pdf). New Jersey Transit. March 2015. Retrieved 2015-04-02. ^ a b c "NJ Transit Facts At a Glance Fiscal Year 2014" (pdf). NJ Transit. March 2015. Retrieved 2015-04-02. ^ a b "Hudson-Bergen - Light Rail" (pdf). NJ Transit. March 2013. Retrieved 2013-07-14. ^ a b "Valley Metro Expands Safe Place". Valley Metro. Mar 21, 2016. Retrieved Mar 29, 2016. ^ "Mesa Extension Opening Seven Months Early" (Press release). Valley Metro. June 3, 2015. Retrieved 2015-09-09. ^ "Northwest Light Rail Extension Opens". Valley Metro. Mar 19, 2016. Archived from the original on 2016-03-28. Retrieved Mar 29, 2016. ^ a b "Procurement Information". Bi-State Development Agency (Metro). 2010. Archived from the original on 2013-08-18. Retrieved 2013-08-11. ^ "History - The 1990s - MetroLink". Bi-State Development Agency (Metro). 2010. Archived from the original on 2013-08-23. Retrieved 2013-08-11. ^ "Procurement Information" (PDF). Bi-State Development Agency (Metro). Archived from the original (pdf) on 2016-03-28. Retrieved 2013-08-25. ^ "History - 2000 to Today - MetroLink". Bi-State Development Agency (Metro). 2010. Retrieved 2013-08-25. ^ a b c d e "Sacramento Regional Transit District: Fact Sheet" (PDF). Sacramento Regional Transit District. May 2016. Retrieved 2016-06-22. 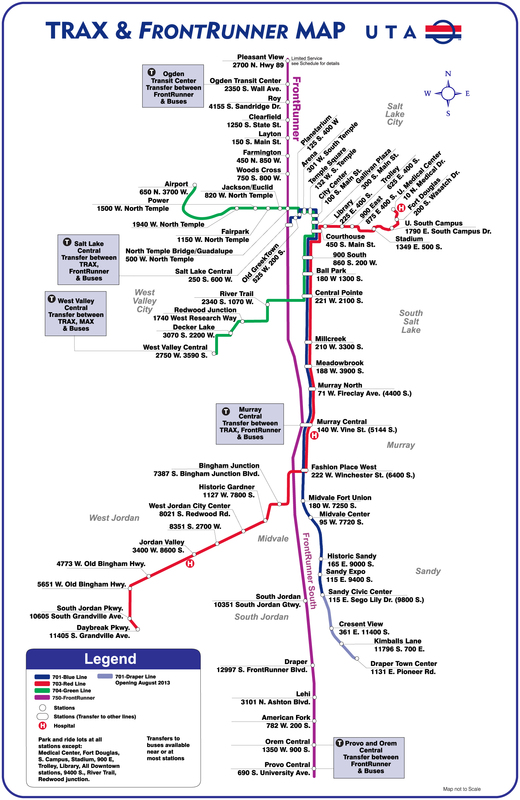 ^ a b c d e "VTA Facts: Light Rail System Overview" (pdf). Santa Clara Valley Transportation Authority (VTA). November 14, 2012. Archived (PDF) from the original on August 20, 2013. Retrieved 2017-05-19. ^ a b c d "Port Authority of Allegheny County - Company Info & Projects - Agency Profile". Port Authority of Allegheny County (PAT). 2013. Retrieved 2013-07-15. ^ a b c "Visitors Ride Guide" (pdf). Maryland Transit Administration. Retrieved 2013-07-14 – via http://mta.maryland.gov/content/visitors. ^ a b c "New Orleans Streetcars - New Orleans Online". The Official Tourism Site of the City of New Orleans: NewOrleansOnline.com. 2013. Retrieved 2013-07-16. ^ "APTA Streetcar and Heritage Trolley Site - New Orleans Overview". American Public Transportation Association. Retrieved 2013-07-16. ^ "Cable Cars | SFMTA". San Francisco Municipal Transportation Agency. 2013. Retrieved 2013-06-30. ^ "Routes & Stops | SFMTA - Cable Cars". San Francisco Municipal Transportation Agency. 2013. Retrieved 2013-08-25. ^ a b c d e "Streetcar History | Portland Streetcar". Portland Streetcar, Inc. 2012. Archived from the original on 2013-12-03. Retrieved 2013-11-28. ^ a b "Newark - Light Rail" (pdf). NJ Transit. June 2013. Retrieved 2013-07-14. ^ a b c "LYNX Home". Charlotte Area Transit System (CATS). Retrieved 2013-08-07. ^ "LYNX Blue Line Recognizes Ridership Success During Week of Five-Year Anniversary". Charlotte Area Transit System (CATS). November 28, 2012. Retrieved 2013-08-07. ^ a b "Metro Rail 7 Day Timetable" (pdf). NTFA-Metro. September 4, 2016. Archived (PDF) from the original on October 2, 2013. Retrieved 2017-05-19. ^ a b c "OC Transpo - O-Train". OC Transpo. 2013. Retrieved 2013-07-26. ^ "OC Transpo - History (Looking Back) - Milestones". OC Transpo. 2013. Retrieved 2013-08-06. ^ a b "River Line - Light Rail" (pdf). NJ Transit. March 2013. Retrieved 2013-07-14. ^ a b c "2012 Annual Report - Greater Cleveland Regional Transit Authority". Greater Cleveland Regional Transit Authority. December 31, 2012. Retrieved 2013-07-21. ^ a b "About RTA: History of Public Transit in Greater Cleveland". Greater Cleveland Regional Transit Authority. 2012. Retrieved 2013-07-21. ^ a b c d "NCTD SPRINTER". North County Transit District (San Diego). 2013. Retrieved 2013-06-30. ^ a b c "Hampton Roads Transit – Services – The Tide". Hampton Roads Transit. Retrieved 2017-05-19. ^ "Hampton Roads Transit – Services". Hampton Roads Transit. Retrieved 2017-05-19. ^ "South Lake Union Streetcar". Seattle Streetcar. Retrieved 2016-03-29. ^ a b Seattle Streetcar Map (Map). Seattle Department of Transportation. December 2015. Retrieved 2016-03-29. ^ Lindblom, Mike (January 22, 2016). "Seattle's First Hill Streetcar to open Saturday with free rides". The Seattle Times. Retrieved 2016-03-29. ^ a b "MATA - Memphis Area Transit Authority - Trolley History". Memphis Area Transit Authority (MATA). 2013. Retrieved 2013-08-18. ^ a b "MATA - Memphis Area Transit Authority - Trolley Map". Memphis Area Transit Authority (MATA). 2013. Retrieved 2013-08-18. ^ "TECO Line Streetcar System – Streetcar System". TECOline Streetcar System. 2012. Retrieved 2013-07-02. ^ a b "Downtown Network Map" (PDF). Hillsborough Area Transit Authority (HART). February 2013. Retrieved 2013-07-02. ^ McNamara, Patrick (March 15, 2015). "Tucson's streetcar exceeds ridership expectations". Arizona Daily Star. ^ a b c "Why do we need a streetcar? – The streetcar route". Sun Link Tucson Streetcar. Retrieved 2015-04-02. ^ Harrison, Steve (August 25, 2015). "Streetcar ridership tops projections". The Charlotte Observer. Retrieved August 26, 2015.